Tyrfing V2 104-Key | DREVO :: Game With Cool Tech. Multi-function and Software Support: 5 programmable macro keys can record your key-bindings for quick actions, weapons or gear swaps, and there is also support for windows lock and media control. Powerful software is bundled as well. Customizable RGB backlit: With 9 preset colors and 14 different lighting modes that have a high color rendition. Go further by personalizing each key backlight through software. 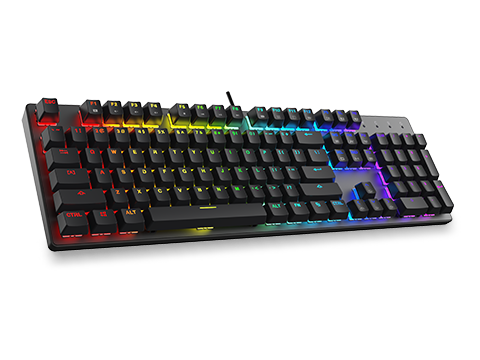 Real Mechanical keyboard: Anti-ghosting, N-key Rollover allows you to control each key independently, delivering an accurate response while maintaining fluidity. Multimedia keys make much fun while playing games. Excellent Workmanship: Aluminium alloy panel, Gold-plated USB connector, high-grade nylon braided USB cable, two rubber feet, and unique ABS laser-marked keycaps combine great feel and better transparency for the backlight.